You lack discipline? Go through stages of eating well and keeping fit but it’s only short term. Are you becoming increasingly frustrated because you can’t lose those last few pounds and your body weight seems to have reached a sticking point. Why the weight loss plateau? Your body has reached homeostasis, an environment it thrives in and feels comfortable, it simply doesn’t want to lose any more weight, and will do everything it can to prevent further calorie restriction and hunger. The main reason for this is the hormone Leptin, which goes down, resulting in metabolic rate decreasing and a increase in hunger, which will eventually cause your bodyfat to a range that’s normal for you. This is your body’s way of defending its set point, a place where your body feels comfortable. If you keep knocking on the door with consistency, you are far more likely to create a new set point and break through the plateau. That’s why creating lifestyle changes and creating good habits is a priority for long term success. 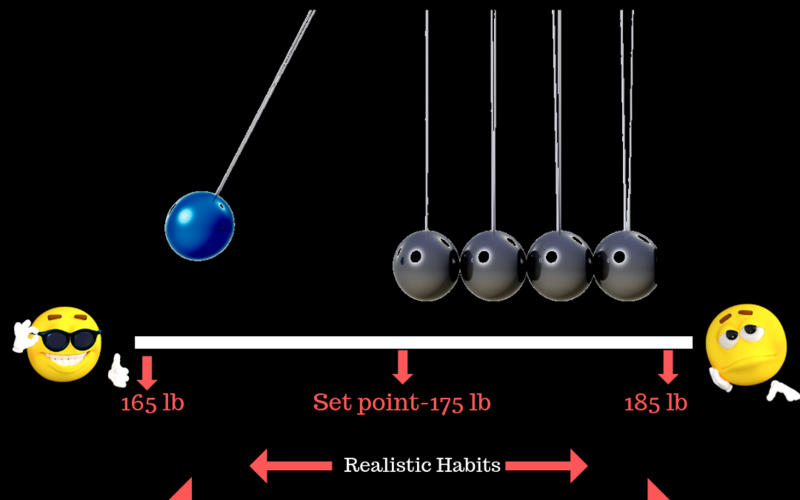 Picture the set point theory as a pendulum. The more extreme your habits are, the more likely you are to get very lean, build muscle etc, but you are also more likely to go in the other direction and back to bad habits, causing you to move further away from achieving your goals. However, to put a different spin on it, if you want to achieve extreme results like get shredded for a bodybuilding show, be prepared to do extreme things. This is a good example for my point on the pendulum theory I mentioned in the paragraph above. You will get shredded by implementing extreme habits, but also be prepared for a big rebound in bodyweight and body fat due to your body’s desire to eat, resulting in binge eating.